The T cell-surface glycoprotein CD6 is a modulator of cellular responses and has been implicated in several autoimmune diseases such as multiple sclerosis, rheumatoid arthritis, and psoriasis. During Ag presentation, CD6 is targeted to the immunological synapse in a ligand binding-dependent manner, in which CD6 domain 3 directly contacts CD166, expressed on the APC. T cell activation results in the induction of CD6Δd3, an alternatively spliced isoform that lacks the ligand-binding domain and thus no longer localizes at the immunological synapse. In this study, we investigated the molecular mechanisms regulating the expression of CD6Δd3 upon human primary T cell activation. Using chromatin immunoprecipitation, we observed an increase in RNA polymerase II occupancy along the CD6 gene and augmented CD6 transcription. We showed that activation leads to transcription-related chromatin modifications, revealed by higher CD6 acetylation levels. Modulation of chromatin conformation using a histone deacetylase inhibitor that increases transcription rate causes an increase of exon 5 skipping. We further showed that the splicing factor SRSF1 binds to a regulatory element in CD6 intron 4, activating exon 5 splicing and promoting exon 5 inclusion. Concomitant with T cell activation-induced exon 5 skipping, we observed a downregulation of SRSF1. Using RNA immunoprecipitation, we showed that in activated T cells, SRSF1 recruitment to the CD6 transcript is impaired by increased chromatin acetylation levels. We propose that upon T cell activation, SRSF1 becomes limiting, and its function in CD6 exon 5 splicing is countered by an increase in CD6 transcription, dependent on chromatin acetylation. The CD6 cell-surface Ag is a type I transmembrane glycoprotein mostly expressed on thymocytes and mature T and B1a lymphocytes (T and B1 cells) (1). CD6 belongs to the scavenger receptor cysteine–rich (SRCR) superfamily of protein receptors, containing three cysteine-rich domains in its extracellular region (2). Human CD6 is encoded by 13 exons, of which the first 7 encode the amino terminal sequence and the extracellular and transmembrane regions, whereas the remaining 6 exons code for the cytoplasmic tail. Each of the three extracellular SRCR domains (d1–d3) is coded by a separate exon (e3–e5). The functional role of CD6 has not been definitively established. Whereas it is undeniable that increased expression of CD6 results in repression of TCR-mediated signaling (3, 4), the direct binding of CD6 with specific Abs or recombinant ligand may enhance cellular responses, presumably through the induced aggregation of protein kinases associated with the cytoplasmic tail of CD6 (3, 5, 6). Notwithstanding the uncertain nature of CD6, possibly even having a dual role, the fact is that CD6 impacts on cell growth and differentiation, and misregulation of the function of CD6 may result in physiological imbalances and autoimmunity. CD6 has been associated with several autoimmune diseases such as multiple sclerosis (7, 8), rheumatoid arthritis (9), psoriasis (10), and Sjögren's syndrome (11) and has been considered as a possible therapeutic target for some of these pathologies (12). The known ligand for CD6 is the Ig super family receptor CD166, expressed on conventional APC and also in thymic epithelia, with the CD6–CD166 interaction being determinant on thymocyte selection (13). CD166 is additionally expressed in the epithelial layer of the blood–brain barrier and enables the transmigration of CD4+ T cells into the brain (14). The interaction between CD6 and CD166 involves the binding of the membrane distal Ig super family domain of APC surface-expressed CD166 to the membrane-proximal SRCR domain 3 of CD6 (15). Importantly, this interaction is fairly strong and can help with strengthening and stabilizing T cell–APC contacts (16). Localization and function of both CD6 and CD166 at the immunological synapse (IS) are determined by and reliant on this binding, and conversely, a naturally occurring alternative splicing–dependent CD6 isoform that lacks domain 3, CD6∆d3, fails to target and recruit CD166 to the IS (17). CD6∆d3 mRNA is expressed in 40% of T lymphocytes, being the dominant isoform in one-quarter of this subpopulation in rats (17). However, upon CD3 plus CD28 stimulation, ∼90% of T cells coexpress CD6∆d3 together with full-length CD6, implying that a large proportion of CD6 molecules is not capable of remaining positioned at the interface with the APC during physiological T cell activation. Double-positive thymocytes show a decrease in the proportion of CD6∆d3, whereas in single-positive CD4 or CD8 thymocytes, CD6∆d3 is expressed in 50% of the cells. Analysis of CD6 isoforms at the protein level is made possible in human T cells due to the availability of mAbs against the different SRCR domains. Concordant with the analysis in the rat system, activation of human T cells induces a large proportion of full-length CD6 protein to be replaced by the CD6∆d3 isoform. As the total amount of CD6 remains roughly constant, this suggests that a significant displacement of CD6 away from the IS occurs during the course of activation. The downmodulation of domain 3 of CD6 thus reveals not only a very interesting mode of positional control of cell surface receptors in physiological processes such as cell activation and thymocyte selection, but also can have an impact on the development of pathology. A recent study showed that the multiple sclerosis–associated SNP rs17824933GG in intron 1 of CD6 was associated with an increase of CD6∆d3 and decrease of full-length CD6 expression in T cells, which resulted in a diminished long-term proliferation of CD4+ T cells, suggesting the involvement of CD6∆d3 in the disease (18). Alternative splicing in cells of the immune system is physiologically relevant, as it allows a diversified number of cellular responses and results in a rapid adaptation to the challenging environment (19). However, the molecular mechanisms involved in some of these alternative splicing events, in particular those occurring during T cell activation, are mostly uncharacterized. A few examples of alternative spliced transcripts in the immune system context have been described. One of the first examples was the IgH, which encodes both membrane-associated and secreted proteins through alternative RNA processing reactions (20). Another example is the alternative splicing of exon v5 of CD44, which is regulated by phosphorylated SAM68, an Erk target (21). The Ras–MAPK pathway has also been implicated in regulating exon 4 alternative splicing of CD45 during T cell development, via glycogen synthase kinase 3 (22). The IL-7Rα alternative splicing is another example: when exon 6 is skipped, the receptor loses the transmembrane domain and is secreted (23). Fas is also regulated by alternative splicing of the exon 6 by FASTK-associated with TIA1/TIAR and other splicing factors: a receptor with a proapoptotic function is produced when exon 6 is included and with an antiapoptotic function when exon 6 is excluded (24). The regulation of alternative splicing is dictated by RNA cis-elements that are frequently located in the alternative exon and in the flanking introns. These elements can be exonic or intronic splicing enhancers (ISE), stimulating the recognition of the splicing sites that are flanking the exon or exonic or intronic silencers inhibiting this recognition by the spliceosome machinery (25). These elements are binding sites for silencing factors, heterogeneous nuclear ribonucleoproteins (hnRNPs), enhancer factors, or serine/arginine-rich proteins (26–30). Additionally, chromatin structure and histone modifications such as methylations and acetylations affect RNA polymerase II (RNA pol II) elongation rate and recruit splicing factors through adaptor proteins, acting as a bridge between the processes of transcription and splicing (31–37). Transcription elongation factors or drugs that promote an open chromatin state, such as trichostatin A (TSA), favor an increase of RNA pol II elongation rate, increasing exon skipping (35, 38, 39). In contrast, inhibition of RNA pol II elongation rate usually results in the augmented inclusion of an alternative exon (40–42). Alternative splicing of exon 5 in the CD6 gene is physiologically and functionally relevant, as the differential expression of the membrane-proximal SRCR domain coded by that exon determines CD6 and CD166 localization or exclusion from the IS. In this study, we show that activation-induced CD6 exon 5 skipping in T cells involves the downmodulation and recruitment of the SRSF1 splicing factor to an ISE in CD6 intron 4 that together with an increase in the RNA pol II transcription rate of the CD6 gene contribute to the production of a CD6 isoform devoid of the ligand-binding domain. Buffy coats from healthy donors were provided by Hospital São João, Serviço de Imunohemoterapia (Porto, Portugal), and PBMCs were isolated by density-gradient separation using Lympholyte-H (Cedarlane Laboratories). T cells were isolated from PBMCs using the Easysep Human T Cell Enrichment Kit (StemCell Technologies). Cells were maintained in RPMI 1640 Glutamax with 10% FBS, 1% sodium pyruvate, and 1% penicillin-streptomycin (Life Technologies). T cells were stimulated overnight with PHA-P at 10 μg/ml or with a combination of anti-CD3 (OKT3) at 2 μg/ml and anti-CD6 (MEM-98) at 10 μg/ml. In chromatin-modulation experiments, 6 × 106 cells were treated with 0.5 μM TSA or with 10 μM camptothecin for 1 h at 37°C. To construct the CD6 minigene, the genomic DNA region from exon 4–6 was amplified by PCR and cloned into the pCMVdi vector (kindly given by Juan Valcárcel, Centre de Regulación Genómica, Barcelona, Spain). Intron 4 mutants were made by PCR site-directed mutagenesis using Phusion DNA polymerase (Fynnzymes). T7 epitope–tagged vectors pCGT7SF2, pCGT7SRp20, and pCGT7A1 used for overexpression of the splicing factors SRSF1, SRSF3, and hnRNPA1, respectively, were a kind gift from Javier Cáceres (Medical Research Council, Edinburgh, U.K.). Cells were transfected by nucleofection using the Amaxa Human T Cell Nucleofactor kit (Lonza). A total of 2 μg each CD6 minigene mutant or T7-tagged expression vectors were used for cell transfections (Supplemental Fig. 4A). For the knocking down experiments, PBMCs were transfected with small interfering RNAs (siRNAs; Sigma-Aldrich) (SRSF1, 5′-ACGAUUGCCGCAUCUACGU-3′; SRSF3#1, 5′-CGAAGUGUGUGGGUUGCUA-3′; SRSF3#2, 5′-GAGAAGUGGUGUACAGGAA-3′; hnRNPA1#1, 5′-CCACUUAACUGUGAAAAAGAUAUUU-3′; and hnRNPA1#2, 5′-CUUUGGUGGUGGUCGUGGA-3′) at a final concentration of 50 nM for SRSF1 and SRSF3 and 300 nM for hnRNPA1 (Supplemental Fig. 4B, 4C). Total RNA and protein extracts were isolated after 48 h of incubation at 37°C, 5% CO2. Cells were washed twice with ice-cold PBS and centrifuged for 5 min at 290 × g at 4°C. The cell pellet was resuspended in 1 ml RSB buffer (10 mM Tris-Cl pH 7.4, 10 mM NaCl, and 3 mM MgCl2) and incubated 3 min on ice. Cells were pelleted at 1500 × g for 3 min at 4°C, the supernatant was discarded, and the cells were lysed by gentle resuspension in 150 μl RSBG40 buffer (10 mM Tris-Cl [pH 7.4], 10 mM NaCl, 3 mM MgCl2, 10% glycerol, and 0.5% Nonidet P-40). Samples were centrifuged at 4500 × g for 3 min at 4°C. The supernatant (cytoplasmic fraction) was collected in a new Eppendorf tube (Eppendorf), and 1 ml TRIzol (Invitrogen) was added to extract cytoplasmic RNA according to the manufacturer’s protocol. The nuclei pellet was also resuspended in 1 ml TRIzol (Invitrogen) to extract the nuclear RNA. Total RNA from human primary T cells was isolated using TRIzol (Invitrogen), and 500 ng RNA for each condition was treated with DNAse I (Roche). cDNA was synthetized using Superscript III reverse transcriptase (Invitrogen) according to the manufacturer’s protocol. A total of 25% of the RT reaction volume was used to analyze endogenous CD6 exon 5 alternative splicing pattern by PCR amplification with Go Taq DNA polymerase (Promega). In the case of CD6 minigene mutants, cDNA was synthesized with a plasmid RT primer, and radiolabeled primers were used in a low-cycle (20 cycles) PCR reaction. Quantitative PCR (qPCR) reactions were performed with a 1:10 cDNA dilution using IQ SYBR Green Supermix (Bio-Rad) and following the manufacturer’s instructions. Primer sequences are available upon request. Due to donor variability, the resting CD6 exon 5 splicing pattern was confirmed prior to analysis. Whole-cell lysates were prepared, resolved, and transferred with the iBlot gel transfer device (Life Technologies). Incubations with primary Abs diluted in TBST containing 3% nonfat dried milk were followed by washes with TBST, incubation with the appropriate secondary Abs in TBST/dried milk, and detection using enhanced chemiluminescence (ECL Prime; Amersham/GE Healthcare). Abs used were: anti-SRSF1 (AK96, a kind gift from Adrian Krainer, Cold Spring Harbor Laboratory), anti-hnRNP A1 (9H10; kind gift from Gideon Dreyfuss, Howard Hughes Medical Institute), and anti-SRp20 (7B4-sc13510; Santa Cruz Biotechnology). Chromatin immunoprecipitation (ChIP) was performed using human T cells as previously described (37). The relative occupancy of the immunoprecipitated protein at each DNA site was estimated as follows: 2Ct (input)−Ct (IP), where Ct (input) and Ct (IP) are mean threshold cycles (Ct) of quantitative RT-PCR done in duplicate on DNA samples from input and specific immunoprecipitations, respectively. Abs used: rabbit polyclonal anti–Pol II (N20; Santa Cruz Biotechnology); anti–histone H3 (ab1791; Abcam); anti-H3K36me3 (ab9050; Abcam); anti-H3K9me3 (ab8898; Abcam), and anti-H3K9Ac (ab10812; Abcam). Primer sequences are available upon request. RNA immunoprecipitation (RIP) was performed using the EZ-Magna RIP RNA-Binding Protein Immunoprecipitation Kit (Merck Millipore). A rabbit mAb anti-SRSF1 (ab133689; Abcam) was used. The relative occupancy of the immunoprecipitated protein at each RNA site was estimated as described above for the ChIP assay. A total of 5000 cpm of intron 4 premRNA probes were incubated in 50-μl reaction mixtures containing 100 μg PBL nuclear extracts, 32 mM HEPES (pH 7.9), 1.56 mM MgCl2, 0.5 mM ATP, 20 mM creatine phosphate, and 2.6% polyvinyl alcohol. Samples were incubated at 30°C for 20 min, UV-crosslinked in a Hoefer UVC 500 Ultraviolet Crosslinker (254 nm for 9 min, 4 cm from light source; Hoefer), and treated with 5 μg RNase A (1 μg/μl) at 37°C for 30 min. A 10% aliquot of the cross-linked samples was loaded on a 12% SDS-PAGE. For immunoprecipitation, 100 μl tissue culture supernatant of monoclonal anti-SRSF1 Ab (AK96) and 35 μl Protein A Sepharose beads 50% slurry (#CL-4B-200; Sigma-Aldrich) were added to 80% cross-linked material, and 0.1 M KCl Buffer D was added to a final volume of 200 μl. The mixture was incubated overnight at 4°C in a rotative wheel. Beads were washed two times with ice-cold Binding Buffer I (20 mM HEPES [pH 7.9], 150 mM NaCl, and 0.05% Triton X-100) and two times with ice-cold Binding Buffer II (20 mM HEPES [pH 7.9], 150 mM NaCl, and 1% Triton X-100). After the last wash, the supernatant was completely removed, and beads were resuspended in 35 μl 2× SDS-loading dye and heated for 5 min at 95°C. After centrifugation, the supernatant was loaded on a 12% SDS-PAGE. Gels were fixed for 35 min at room temperature in a fixing solution before drying. Gels were exposed to a radiographic film. We have previously shown that skipping of exon 5 of CD6 is induced by T cell activation, resulting in an increase of the CD6Δd3 mRNA isoform, which is translated into a CD6 polypeptide that lacks the domain of interaction with its ligand, CD166 (schematically represented in Fig. 1A) (17). To investigate the molecular mechanisms regulating T cell activation–dependent alternative splicing of CD6, we first confirmed the pattern of exon 5 skipping in human PBMCs activated with the mitogenic lectin PHA-P. As expected, PHA induced a switch in the exon 5 alternative splicing pattern, resulting in a >2-fold decrease of the ratio between the CD6 full-length mRNA isoform (CD6FL) and the isoform omitting exon 5 (CD6Δd3) (Fig. 1B, 1C). This switch is also observed in purified T cells activated with anti-CD3 and anti-CD6 mAbs (Supplemental Fig. 1). CD6Δd3 is upregulated upon T cell activation. (A) Schematic representation of CD6 exon 5 alternative splicing pattern in resting and activated T cells (left panel). CD6 full-length and CD6 alternative isoform, CD6Δd3, protein representation (right panel). (B) Semiquantitative RT-PCR analysis of CD6 exon 5 alternative splicing pattern in resting and PHA-stimulated PBMCs. (C) Graphic representation showing the ratio between exon 5 containing isoform (FL) and the isoform that lacks exon 5 (∆d3) in resting and activated state. Error bars represent SEM. n = 3. The asterisk indicates statistical significance (*p < 0.05, Student t test). It was also apparent that activation with PHA induced an increment in the levels of the full-length mRNA isoform, suggesting a general transcriptional induction (Fig. 1b). To understand how transcription of CD6 was regulated upon T cell activation, we purified T lymphocytes from blood and analyzed changes in RNA pol II occupancy in the CD6 gene and CD6 expression levels occurring in resting and activated T cells using ChIP (Fig. 2). Upon T cell activation, an overall increase of RNA pol II occupancy throughout the CD6 gene was observed (Fig. 2b), concurring with an increase in CD6 transcription (Fig. 2c). Characterization of RNA pol II occupancy levels and CD6 expression in resting and activated T cells. (A) Schematic representation of human CD6 locus. Exons are represented by boxes, and introns are shown as a thin line. The region for specific qPCR primers pairs is underlined. (B) Graphic representation of RNA pol II occupancy levels in CD6 gene in resting and activated T cells evaluated by ChIP assays showing an increase of RNA pol II occupancy upon T cell activation (n = 5). (C) CD6 expression levels in resting and activated PBMCs were analyzed by qPCR, revealing an increase of expression upon cell activation with PHA (n = 3). Error bars represent SEM. The asterisk indicates statistical significance (*p < 0.05 Student t test). Accumulating evidence indicates that alternative splicing is influenced by chromatin histone modifications (43), in particular H3K36me3 and H3K9me3 (32, 33). To investigate whether these regulatory mechanisms could also govern CD6 exon 5 alternative splicing, we analyzed the pattern of H3K36me3 and H3K9me3 in the CD6 gene, in resting and activated T cells. H3K36me3 levels were increased in the body of the gene compared with the first exon and the intergenic region (Supplemental Fig. 2A), as it occurs in actively transcribed genes (44). H3K9me3 levels that were described to be enriched in a subset of alternative exons (33) were decreased in the body of the CD6 gene in comparison with the intergenic region (Supplemental Fig. 2B). However, there were no differences in H3K36me3 and H3K9me3 levels either between resting and activated T cells or comparing exon 5 with the neighboring exons. This indicates that these epigenetic marks are not modulated in the CD6 gene by T cell activation, and they do not have a function in CD6 alternative splicing. It has been shown that active genes show altered H3K9 acetylation levels upon T cell activation (45). We thus characterized histone H3K9 acetylation in CD6 in resting and activated T cells (Fig. 3A). By contrast with the methylation marks analyzed, we detected an overall increase in H3K9Ac in activated T cells. These differences are statistically significant at the 5′ end of the gene as expected and also in exon 5. Treatment of HeLa cells with inhibitors of histone deacetylases (HDACs) have been shown to cause alterations in the splicing pattern of alternatively spliced exons (46). We thus hypothesized that upon T cell activation, the CD6 gene could undergo alterations in the chromatin structure to facilitate the accessibility of the transcription machinery, resulting in the increased CD6 mRNA levels and exon 5 skipping observed. When we treated T cells with an inhibitor of HDACs (TSA), an increase in the levels of transcripts lacking exon 5 was observed (Fig. 3B), suggesting that the open chromatin state promotes skipping of exon 5. Conversely, when T cells were incubated with an inhibitor of topoisomerase I, camptothecin, which hampers RNA pol II elongation, the opposite effect in the alternative splicing pattern was observed: inclusion of exon 5 was promoted (Fig. 3B). We quantified both CD6 mRNA isoforms and confirmed that TSA as well as camptothecin have significant but opposite effects in the splicing pattern of exon 5 (Fig. 3C), suggesting that the RNA pol II transcription rate plays a determinant role in the skipping or inclusion of exon 5 in CD6 pre-mRNA. 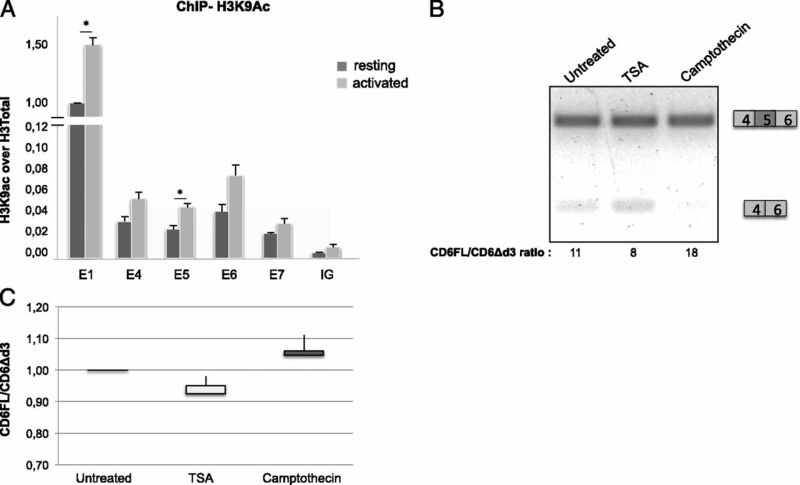 CD6 H3K9Ac levels in resting and activated T cells and CD6 chromatin structure modulation. (A) Graphic representation of H3K9Ac levels in CD6 gene in resting and activated T cells evaluated by ChIP assay shows an increase of acetylation upon T cell activation. (B) Semiquantitative RT-PCR showing the TSA and camptothecin effects in CD6 exon 5 alternative splicing pattern. (C) CD6 isoform expression levels were analyzed by qPCR. Primers were designed to span the 4 to 5 and 4–6 exon junction regions. Error bars represent SEM. n = 3. The asterisk indicates statistical significance (*p < 0.05, Student t test). Using the UCSC Genome Browser, we found several peaks of conservation in intron 4, distant from the splice sites. These are conserved in 46 species of vertebrates, suggesting the presence of important regulatory elements (Supplemental Fig. 3A). We therefore generated a functional minigene containing the genomic fragment spanning exons 4–6 to characterize the cis elements involved in CD6 alternative splicing (Supplemental Fig. 3B). Importantly, when transfected into PBMCs, this minigene recapitulates the alternative splicing pattern of the endogenous CD6 gene, with the majority of transcripts containing exon 5 (Supplemental Fig. 3C, left panel). Moreover, upon PHA-induced T cell activation, there is the same enrichment of CD6Δd3 over CD6FL as observed in endogenous CD6 (Supplemental Fig. 3C, right panel, compared with Fig. 1B, Supplemental Fig. 1). This indicates that the minigene contains all of the necessary sequences to promote CD6 exon 5 alternative splicing and can be used to characterize the cis-regulatory elements involved. To characterize the conserved region in intron 4, we engineered the minigene to introduce specific deletions originating the constructs depicted in Fig. 4A. Minigene mutant i4Δ1, containing a 436-nt deletion in the central region of intron 4 (nt 193–629) (Fig. 4A), was transfected into resting T cells, and the splicing pattern was analyzed by RT-PCR. A complete switch in exon 5 alternative splicing was observed, with a >3-fold reduction in the mRNA isoforms ratio (relative increase of CD6Δd3 over CD6FL) (Fig. 4B). A mutant having a smaller deletion (i4Δ6) induced a statistically significant similar reduction, indicating that an ISE for exon 5 inclusion is contained in the region between nt 297 and 629 of intron 4 (Fig. 4B). This is a sequence-specific effect, as confirmed by replacement of the i4 297–629 sequence by an unrelated sequence (i4Δ6 crtl) (Fig. 4B). Mapping of regulatory regions in intron 4. (A) Different mutants, each one having different deletions in intron 4, were created by PCR-directed mutagenesis and used for transient transfection in human T cells. (B–D) Graphic representation of the CD6FL/CD6Δd3 ratios in intron 4 mutants and CD6 WT minigene determined by semiquantitative RT-PCR. (E) Schematic representation of intron 4 regulatory elements. Error bars represent SEM. n = 3; (E) n = 2. The asterisks indicate statistical significance (*p < 0.05, **p < 0.01, Student t test). E, enhancer; S, silencer. To fine-map the ISE identified, three mutants containing deletions of ∼100 nt were generated, each one lacking one-third of the i4Δ6 deleted region (A, Δ297–383; B, Δ384–481; and C, Δ482–629), and transfected into T cells (Fig. 4C). Intriguingly, deletion of any of the three regions (A, B, and C) induced only a partial 2-fold reduction in the CD6FL/CD6Δd3 ratio when compared with unmodified i4 (Fig. 4C), suggesting that several regulatory elements may be present. To further dissect this region, mutant minigenes having combined or overlapping sequences excluded in the nt 297–629 region were transfected and their splicing pattern analyzed (Fig. 4D). Deletion of nt 297–481 (AB) induced a reduction of ∼3-fold in the CD6FL/CD6Δd3 isoforms ratio compared with wild-type (WT) i4. By contrast, mutant BC (Δ384–629) did not induce any alterations in the ratio (Fig. 4D). In addition, deleting regions A and C together again introduced a significant reduction in the CD6FL/CD6Δd3 ratio (Fig. 4D). Taken together, these results suggest that both silencer and enhancer elements coexist in region BC, as contrasted with the effect (increased exon 5 skipping) of deleting regions B or C independently; deletion of B together with C (BC) does not result in significant differences in comparison with the WT. We therefore constructed an additional mutant (D, Δ451–544) for which the deleted sequences comprise part of region B and part of region C. Interestingly, this deletion causes a significant increase in exon 5 inclusion (2-fold increase in the CD6FL/CD6Δd3 ratio), suggesting that it contained an inhibitory sequence for exon 5 inclusion (Fig. 4E). As alternative splicing of exon 5 of the CD6 gene is regulated by T cell activation, we investigated variations in the expression of relevant splicing factors in resting and activated T cells by RT-qPCR and immunoblotting. Within the nt 297–629 regulatory sequence of intron 4, there are several putative binding sites for splicing factors such as SRSF1, SRSF2, SRSF3, SRSF5, SRSF6, hnRNPA1, hnRNPAB, hnRNPH/F, and PTB as determined by bioinformatics analyses (SFmap Web site: http://sfmap.technion.ac.il/index.html). We focused on those presenting the highest SFmap algorithm scores (i.e., SRSF1, SRSF3, and hnRNPA1). Upon PHA-induced T cell activation, there were no significant alterations in mRNA or protein expression of either hnRNP A1 or SRSF3 (Fig. 5A, 5B); however, SRSF1 mRNA and protein levels were decreased by ∼50% in activated T cells. To investigate the role of differential SRSF1 levels in CD6 alternative splicing, we used siRNA depletion and overexpression assays. Remarkably, overexpression of SRSF1 resulted in 75% reduction in the expression of the CD6Δd3 isoform (Fig. 5C). Overexpression of SRSF3 and hnRNPA1 also induced significant changes in CD6Δd3 expression (2-fold decrease and 1.5-fold increase, respectively), suggesting that changes in their protein expression, if produced, may also affect CD6 alternative splicing (Fig. 5C). The converse effect on CD6Δd3 isoform expression was observed when all of these splicing factors were siRNA knocked down individually (Fig. 5D). SRSF1 regulates CD6 exon 5 alternative splicing and is less recruited to CD6 pre-mRNA upon T cell activation. (A) qPCR analysis of SRSF1, hnRNP A1, and SRSF3 expression levels in resting and activated T cells. (B) SRSF1, hnRNP A1, and SRSF3 protein levels in resting and activated T cells. (C) Graphic representation of the quantification of CD6Δd3 isoform expression levels upon SRSF1, hnRNP A1, or SRSF3 overexpression (OE). (D) Graphic representation of the quantification of CD6Δd3 isoform expression levels upon SRSF1, hnRNP A1, or SRSF3 knockdown (KD). (E) RIP showing SRSF1 recruitment levels to CD6 primary transcript intron 4 in resting untreated T cells or PHA- or TSA-treated PBMCs. (F) SRSF1 proteins levels in untreated and TSA-treated T cells. (G) UV-crosslinking and immunoprecipitation showing SRSF1 binding to i4Δ6 sequence. Error bars represent SEM. n = 3. The asterisks indicate statistical significance (*p < 0.05, **p < 0.01, Student t test). Given the observed decrease in SRSF1 expression upon T cell activation and the effect of this factor on CD6 alternative splicing, we hypothesized that the lower recruitment of SRSF1 to the regulatory element of intron 4 was the limiting factor for exon 5 inclusion. To investigate this, we performed RIP with a specific Ab for SRSF1 and CD6 primers. Indeed, upon cell stimulation with PHA, a marked decrease of the recruitment of SRSF1 to the intron 4 was evident when compared with untreated cells (Fig. 5E). Importantly, recruitment of SRSF1 to CD6 was also prevented by TSA. As SRSF1 protein levels are not altered by TSA treatment (Fig. 5F), these results suggest that recruitment of SRSF1 to CD6 pre-mRNA is acetylation dependent. To demonstrate that SRSF1 binds to i4Δ6, we performed UV crosslinking and immunoprecipitation assays using the sequence deleted from i4Δ6 as a pre-mRNA template. As can be seen, SRSF1 binds to this element in intron 4 (Fig. 5G). Overall, our results suggest that not only is SRSF1 less expressed upon T cell activation, but it is also strikingly less recruited to an ISE present in intron 4 of the CD6 primary transcript, all resulting in significant increase of exon 5 skipping (Fig. 6). Proposed model of CD6 exon 5 alternative splicing regulation upon T cell activation. Resting T cells present basal CD6 H3K9 acetylation levels, and SRSF1 is efficiently recruited to an intron 4 enhancer (green rectangle), leading to preferential inclusion of exon 5 in the CD6 pre-mRNA. 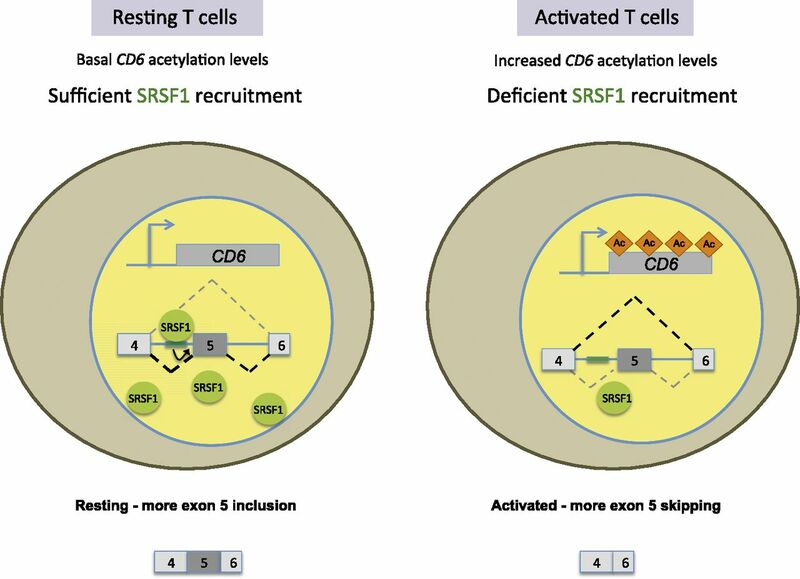 In activated T cells, there is an increase in CD6 H3K9 acetylation levels and a decrease in the recruitment of SRSF1 to the ISE, causing an increase in exon 5 skipping and CD6Δd3 mRNA production. Upon Ag recognition, T cell activation is determined by the balance between activatory and modulatory signals. The first type of signals include the affinity of a given TCR to a specific antigenic peptide presented in the context of MHC complexes displayed at the surface of APCs and also all of the signaling machinery that relays the information received at the cell surface down to the nucleus. This consists of a well-structured pathway that sequentially activates effector enzymes and adapters, such as the Src family kinases Lck and Fyn that phosphorylate the ITAMs of the CD3 complex and the kinase ZAP70 that, upon binding to phosphorylated ITAMs, becomes activated and phosphorylates the membrane adapter LAT, which in turn serves as a docking platform for many downstream effectors such as PLC-γ, PI3K, GADS, Grb2/Sos1 connecting to the Ras–MAPK pathway, Itk, and SLP-76, among others (47). In contrast, there are a few receptors such as CD5 and CD6 that limit TCR-mediated responses at the onset of activation. In the case of CD5, this is achieved through the phosphorylation-dependent recruitment of signaling inhibitory enzymes such as the phosphatase Src homology region 2 domain-containing phosphatase-1, the ubiquitin ligase Cbl, and the Ras GTPase-activating protein (48, 49). The kinases that promote these associations by phosphorylating tyrosine residues of the cytoplasmic tail of CD5 are the same Lck and Fyn that induce positive signaling via the TCR/CD3 complex, although subsequently, CD5 activation can nonetheless modulate the kinase’s activity (50, 51). Regarding CD6, it is still not clear how signaling attenuation is achieved, as none of the CD5-associated inhibitors have been reported to associate with CD6. On the contrary, upon activation and phosphorylation, CD6 becomes packed with effector enzymes and adapters such as Lck, Fyn, ZAP70, Itk, and SLP-76, all connoted with productive signaling and full T cell activation (3, 6). One hypothesis to explain the inhibitory properties of CD6 is that the receptor may function as a decoy adapter, having high affinity for the signaling mediators and thus removing much of the activation potential away from the sites of TCR-mediated signaling initiation. On this line, it is attractive to ponder that upon T cell activation, to promote the skipping of the exon that encodes the ligand-binding domain is a very enticing way of removing this inhibitory receptor away from the IS and thus favors a stronger stimulus. In the current study, we focused on the identification of CD6 exon 5 alternative splicing regulatory elements and factors that are induced following T cell activation and have a striking impact on the subcellular localization of CD6 or, more appropriately, the alternative isoform CD6∆d3. Although this strategy to remove inhibition from the sites of activation may appear complex and intricate, the molecular mechanisms used to induce exon 5 skipping revealed to be surprisingly and paradoxically simple. An increase in CD6 expression due to T cell activation was corroborated by augmented RNA pol II occupancy (Fig. 2) and by a boost in histone acetylation levels (Fig. 3C) in the CD6 gene, leading to a more accessible chromatin state and thus facilitating CD6 transcription and exon 5 skipping. Splicing and polyadenylation are predominantly cotranscriptional events, allowing for crosstalk between these processes. In particular, the RNA pol II transcription elongation rate was demonstrated to affect alternative splicing (52), and we have previously shown the same effect in alternative polyadenylation (53). According to the RNA pol II kinetic coupling model that integrates alternative splicing with transcription kinetics, an increase of the RNA pol II elongation rate affects exon inclusion, depending on the strength of the splice sites (54). Kadener et al. (38) showed that a compact chromatin structure of a replicated reporter plasmid acted as a barrier to RNA pol II elongation, leading to a higher exon inclusion. This effect was reverted by inhibition of HDAC, using TSA, promoting histone acetylation and a subsequent chromatin opening. Schor and collaborators (39) characterized a change in chromatin structure upon neuronal cell depolarization that induces the skipping of the alternative exon 18 of NCAM mRNA. These results led us to hypothesize that the chromatin structure could affect exon 5 alternative splicing and prompted us to investigate the H3K9 acetylation profile of the CD6 gene. Our results showed that T cell treatment with the HDAC inhibitor TSA promotes skipping of exon 5, mimicking the effect of T cell activation on CD6 alternative splicing. Conversely, when we decreased the RNA pol II elongation rate, we promoted inclusion of exon 5 (Fig. 3B). Taken together, our results indicate that the chromatin structure alterations that occur upon T cell activation and an increase in the transcription rate of CD6 may favor exon 5 skipping from the mature mRNA. The fact that the most mature rat single-positive thymocytes, which have higher CD6 expression than double-positive thymocytes, present increased levels of exon 5 skipping seems to corroborate our interpretation that the levels and rate of transcription of the CD6 gene are coresponsible for the generation of an alternative transcript. The selection of 5′ and 3′ splice sites in pre-mRNA is governed in part by RNA sequences, the “splicing code,” and RNA binding proteins (55–57). To investigate the importance of RNA motifs and the trans-acting factors in the regulation of CD6 alternative splicing, we used a minigene that mimics the endogenous CD6 exon 5 splicing event. We identified a highly conserved regulatory element localized in intron 4 containing a complex set of splicing enhancers and silencers that strongly regulates exon 5 inclusion. As this element contains putative binding sites for several splicing factors, we quantified the expression of these splicing factors in resting and activated T cells. Surprisingly, we observed that the expression of SRSF1 was decreased upon T cell activation, whereas that of hnRNP A1 and SRSF3 remained approximately constant. We also showed that all three factors can affect CD6 alternative splicing (SRSF1 and SRSF3 promote exon 5 inclusion, and hnRNP A1 increases exon 5 skipping), but only SRSF1 had its expression effectively decreased in activated T cells. SRSF1 is a prototype member of the serine/arginine-rich protein family of splicing factors with a role in alternative splicing (58–61). SRSF1 has been extensively studied; however, only a few endogenous target genes have been identified (62–65). Our results indicate that, upon T cell activation, the deficit of SRSF1 may be crucial for exon 5 exclusion, with SRSF1 most likely becoming a limiting factor for the increased levels of CD6 transcription and CD6Δd3 mRNA increase detected upon T cell activation. Using RIP, we detected a decrease of SRSF1 recruitment to the CD6 primary transcript in activated T cells that could be explained not only by a decrease of SRSF1 expression, but also by the effect that an increased chromatin acetylation level has in the recruitment of this splicing factor, as shown by others (39). Our ChIP experiments for H3K9ac revealed an increase of CD6 acetylation level upon T cell activation. Accordingly, when we treated cells with TSA, we observed less SRSF1 recruitment to the CD6 primary transcript. A similar effect was observed in neuroblastoma cells by Schor and collaborators (66), showing that chromatin acetylation upon cell membrane potential depolarization led to an accumulation of SRSF1 in the nuclear speckles, being less recruited to the primary transcripts compromising the splicing of nascent RNA. Although it was previously shown that TSA treatment did not affect the acetylation levels of T7-tagged SRSF1 transfected into HEK-293T cells (66), it is still possible that TSA causes SRSF1 acetylation, leading to a differential recruitment to CD6 pre-mRNA. In fact, acetylation of nonhistone proteins such as SRSF2 was already described and promotes its proteosomal degradation (67). The working model we propose for the regulation of CD6 exon 5 alternative splicing upon T cell activation is depicted in Fig. 6. In resting conditions, T cells have a basal CD6 transcription level, with sufficient SRSF1 levels to bind to the intron 4 regulatory element. In these conditions, SRSF1 promotes the inclusion of exon 5 in the majority of mature mRNAs. Upon T cell activation, an increase of CD6 acetylation levels and a consequent chromatin structure modification facilitates CD6 transcription. Under these activation conditions, there is a deficient recruitment of SRSF1 to intron 4, which is necessary for exon 5 inclusion, leading to exon skipping and the production of CD6Δd3. Taken together, we showed that the human T cell activation–induced alternative splicing of the CD6 gene is regulated at multifactorial levels, with chromatin structure, transcription rate, and splicing factor SRSF1 having fundamental roles. As CD6 has been associated with several autoimmune diseases, the molecular mechanisms regulating CD6 alternative splicing upon activation of human T cells provide new insight into a physiologically relevant molecule. We thank Adrian Krainer, Gideon Dreyfuss, Juan Valcárcel, Javier Caceres, Doug Black, and Kristen Lynch for kindly providing reagents. We also thank Alberto Kornblihtt and Telmo Henriques for helpful discussions and all current and previous members of the laboratories for suggestions. This work was supported by the European Regional Development Fund, Programa Operacional Ciência, Tecnologia e Inovação 2010 (POCI and POCTI 2010), and the Fundação para a Ciência e Tecnologia (PTDC/SAU-GMG/116621/2010, PTDC/BEX-BCM/0468/2012, PTDC/IMI-IMU/0158/2012).
. 1981. A novel human T cell antigen preferentially expressed on mature T cells and shared by both well and poorly differentiated B cell leukemias and lymphomas. J. Immunol. 127: 987–991.
. 2006. CD6 regulates T-cell responses through activation-dependent recruitment of the positive regulator SLP-76. Mol. Cell. Biol. 26: 6727–6738.
. 2012. CD6 attenuates early and late signaling events, setting thresholds for T-cell activation. Eur. J. Immunol. 42: 195–205.
. 1993. Activation of human T cells through CD6: functional effects of a novel anti-CD6 monoclonal antibody and definition of four epitopes of the CD6 glycoprotein. Int. Immunol. 5: 783–792.
. 2003. OX52 is the rat homologue of CD6: evidence for an effector function in the regulation of CD5 phosphorylation. J. Leukoc. Biol. 73: 183–190.
. 2009. Meta-analysis of genome scans and replication identify CD6, IRF8 and TNFRSF1A as new multiple sclerosis susceptibility loci. Nat. Genet. 41: 776–782.
. 2010. Validation of the CD6 and TNFRSF1A loci as risk factors for multiple sclerosis in Spain. J. Neuroimmunol. 223: 100–103.
. 2012. A clinical exploratory study with itolizumab, an anti-CD6 monoclonal antibody, in patients with rheumatoid arthritis. Res. Immunol. 2: 204–211.
. 1999. CD6 molecule may be important in the pathological mechanisms of lymphocytes adhesion to human skin in psoriasis and ior t1 MAb a possible new approach to treat this disease. Autoimmunity 29: 155–156.
. 2010. Aberrant expression of CD6 on B-cell subsets from patients with Sjögren’s syndrome. J. Autoimmun. 35: 336–341.
. 2013. CD6 as a therapeutic target in autoimmune diseases: successes and challenges. BioDrugs: clinical immunotherapeutics, biopharmaceuticals and gene therapy 27: 191–202.
. 2002. CD6: expression during development, apoptosis and selection of human and mouse thymocytes. Int. Immunol. 14: 585–597.
. 2008. Activated leukocyte cell adhesion molecule promotes leukocyte trafficking into the central nervous system. Nat. Immunol. 9: 137–145.
. 1996. The amino-terminal immunoglobulin-like domain of activated leukocyte cell adhesion molecule binds specifically to the membrane-proximal scavenger receptor cysteine-rich domain of CD6 with a 1:1 stoichiometry. J. Biol. Chem. 271: 17390–17396.
. 2004. Frontline: Optimal T cell activation requires the engagement of CD6 and CD166. Eur. J. Immunol. 34: 930–940.
. 2007. Extracellular isoforms of CD6 generated by alternative splicing regulate targeting of CD6 to the immunological synapse. J. Immunol. 178: 4351–4361.
. 2011. The CD6 multiple sclerosis susceptibility allele is associated with alterations in CD4+ T cell proliferation. J. Immunol. 187: 3286–3291.
. 2013. Control of alternative splicing in immune responses: many regulators, many predictions, much still to learn. Immunol. Rev. 253: 216–236.
. 1995. Alternative processing of IgA pre-mRNA responds like IgM to alterations in the efficiency of the competing splice and cleavage-polyadenylation reactions. Mol. Immunol. 32: 277–285.
. 2002. Signal-dependent regulation of splicing via phosphorylation of Sam68. Nature 420: 691–695.
. 2010. 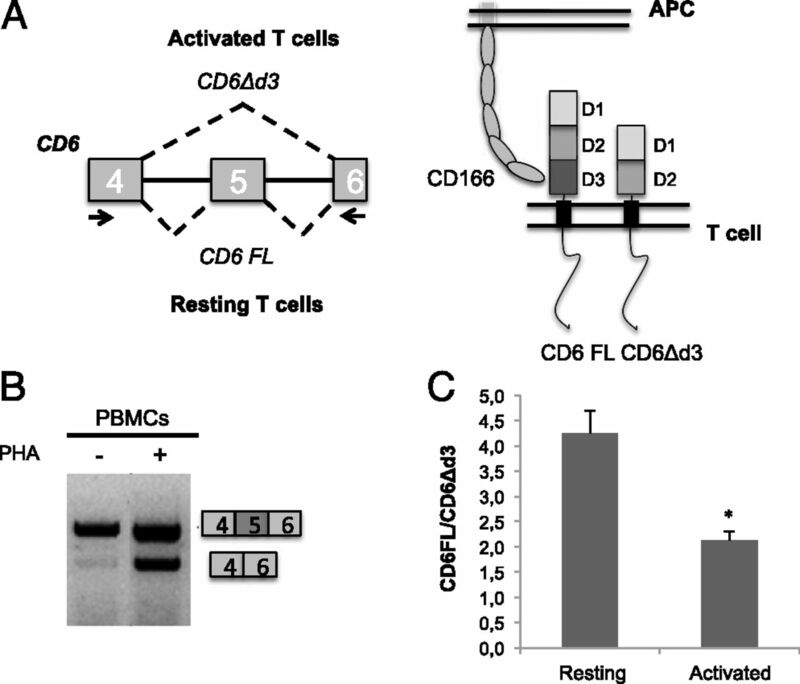 Phosphorylation-dependent regulation of PSF by GSK3 controls CD45 alternative splicing. Mol. Cell 40: 126–137.
. 1990. Cloning of the human and murine interleukin-7 receptors: demonstration of a soluble form and homology to a new receptor superfamily. Cell 60: 941–951.
. 2007. Fas-activated serine/threonine kinase (FAST K) synergizes with TIA-1/TIAR proteins to regulate Fas alternative splicing. J. Biol. Chem. 282: 1539–1543.
. 2002. Finding signals that regulate alternative splicing in the post-genomic era. Genome Biol. 3: reviews0008. 2000. Sorting out the complexity of SR protein functions. RNA 6: 1197–1211.
. 2009. The SR protein family of splicing factors: master regulators of gene expression. Biochem. J. 417: 15–27.
. 2012. Integrative genome-wide analysis reveals cooperative regulation of alternative splicing by hnRNP proteins. Cell Rep. 1: 167–178. 2007. Searching for splicing motifs. Adv. Exp. Med. Biol. 623: 85–106.
. 2007. hnRNP proteins and splicing control. Adv. Exp. Med. Biol. 623: 123–147.
. 2011. CTCF-promoted RNA polymerase II pausing links DNA methylation to splicing. Nature 479: 74–79.
. 2010. Regulation of alternative splicing by histone modifications. Science 327: 996–1000.
. 2011. Histone H3 lysine 9 trimethylation and HP1γ favor inclusion of alternative exons. Nat. Struct. Mol. Biol. 18: 337–344.
. 2009. Nucleosome positioning as a determinant of exon recognition. Nat. Struct. Mol. Biol. 16: 996–1001.
. 2002. Transcriptional activators differ in their abilities to control alternative splicing. J. Biol. Chem. 277: 43110–43114.
. 2009. Chromatin organization marks exon-intron structure. Nat. Struct. Mol. Biol. 16: 990–995.
. 2011. Splicing enhances recruitment of methyltransferase HYPB/Setd2 and methylation of histone H3 Lys36. Nat. Struct. Mol. Biol. 18: 977–983.
. 2001. Antagonistic effects of T-Ag and VP16 reveal a role for RNA pol II elongation on alternative splicing. EMBO J. 20: 5759–5768.
. 2009. Neuronal cell depolarization induces intragenic chromatin modifications affecting NCAM alternative splicing. Proc. Natl. Acad. Sci. USA 106: 4325–4330.
. 1998. Co-transcriptional commitment to alternative splice site selection. Nucleic Acids Res. 26: 5568–5572.
. 2003. Influence of polymerase II processivity on alternative splicing depends on splice site strength. J. Biol. Chem. 278: 52166–52171.
. 2011. Global impact of RNA polymerase II elongation inhibition on alternative splicing regulation. Genome Res. 21: 390–401.
. 2011. Epigenetics in alternative pre-mRNA splicing. Cell 144: 16–26.
. 2005. Spatial distribution of di- and tri-methyl lysine 36 of histone H3 at active genes. J. Biol. Chem. 280: 17732–17736.
. 2005. Active chromatin domains are defined by acetylation islands revealed by genome-wide mapping. Genes Dev. 19: 542–552.
. 2011. 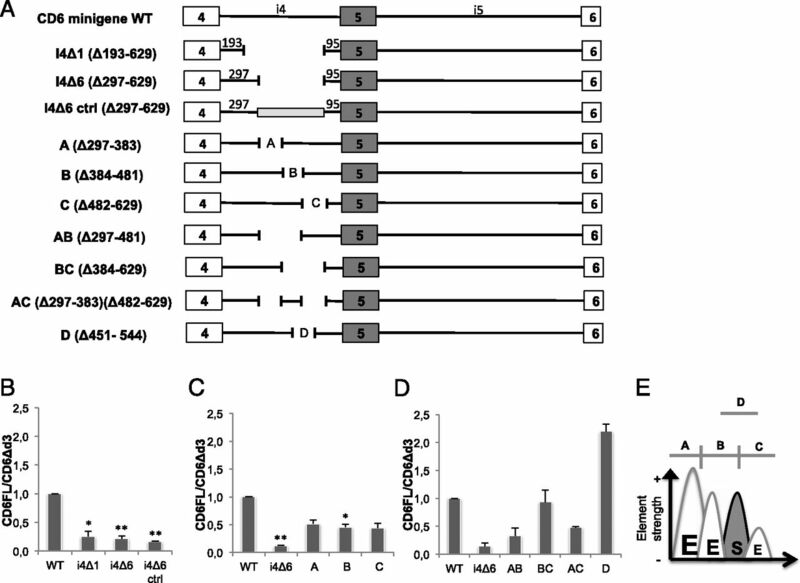 Histone deacetylase activity modulates alternative splicing. PLoS ONE 6: e16727.
. 2009. T-cell receptor proximal signaling via the Src-family kinases, Lck and Fyn, influences T-cell activation, differentiation, and tolerance. Immunol. Rev. 228: 9–22.
. 1999. CD5 negatively regulates the T-cell antigen receptor signal transduction pathway: involvement of SH2-containing phosphotyrosine phosphatase SHP-1. Mol. Cell. Biol. 19: 2903–2912.
. 1998. Thymocyte activation induces the association of the proto-oncoprotein c-cbl and ras GTPase-activating protein with CD5. Eur. J. Immunol. 28: 1617–1625.
. 1992. CD5 acts as a tyrosine kinase substrate within a receptor complex comprising T-cell receptor zeta chain/CD3 and protein-tyrosine kinases p56lck and p59fyn. Proc. Natl. Acad. Sci. USA 89: 9311–9315.
. 2011. A new pathway of CD5 glycoprotein-mediated T cell inhibition dependent on inhibitory phosphorylation of Fyn kinase. J. Biol. Chem. 286: 30324–30336.
. 2013. Alternative splicing: a pivotal step between eukaryotic transcription and translation. Nat. Rev. Mol. Cell Biol. 14: 153–165.
. 2011. RNA polymerase II kinetics in polo polyadenylation signal selection. EMBO J. 30: 2431–2444.
. 2010. First come, first served revisited: factors affecting the same alternative splicing event have different effects on the relative rates of intron removal. RNA 16: 904–912.
. 2009. Decrypting the genome’s alternative messages. Curr. Opin. Cell Biol. 21: 377–386.
. 2008. Splicing regulation: from a parts list of regulatory elements to an integrated splicing code. RNA 14: 802–813.
. 2011. Understanding splicing regulation through RNA splicing maps. Trends Genet. 27: 89–97.
. 2007. Deletion of the N-terminus of SF2/ASF permits RS-domain-independent pre-mRNA splicing. PLoS ONE 2: e854.
. 1993. General splicing factor SF2/ASF promotes alternative splicing by binding to an exonic splicing enhancer. Genes Dev. 7(12B): 2598–2608.
. 1998. Phosphorylation-dephosphorylation differentially affects activities of splicing factor ASF/SF2. EMBO J. 17: 6359–6367.
. 1998. Genetic analysis of the SR protein ASF/SF2: interchangeability of RS domains and negative control of splicing. Genes Dev. 12: 2222–2233.
. 2009. Differential 3′ splice site recognition of SMN1 and SMN2 transcripts by U2AF and U2 snRNP. RNA 15: 515–523.
. 2012. The splicing factor SRSF1 regulates apoptosis and proliferation to promote mammary epithelial cell transformation. Nat. Struct. Mol. Biol. 19: 220–228.
. 2012. Activation-induced cytidine deaminase (AID)-dependent somatic hypermutation requires a splice isoform of the serine/arginine-rich (SR) protein SRSF1. Proc. Natl. Acad. Sci. USA 109: 1216–1221.
. 1999. SF2 and SRp55 regulation of CD45 exon 4 skipping during T cell activation. Eur. J. Immunol. 29: 823–837.
. 2012. Perturbation of chromatin structure globally affects localization and recruitment of splicing factors. PLoS ONE 7: e48084.
. 2011. Acetylation and phosphorylation of SRSF2 control cell fate decision in response to cisplatin. EMBO J. 30: 510–523.